For those that know me well understand my love of appetizers and snacks. I could just snack all day instead of a traditional big meal. The best part of snacking for me is just being able to nibble on small bites for some variety. That said, my favorite snack lately is simple - a toasted piece of bread or crostini, schmeared with cream cheese, topped with smoked salmon and a garnish of fresh snipped chives. Easy, right?! 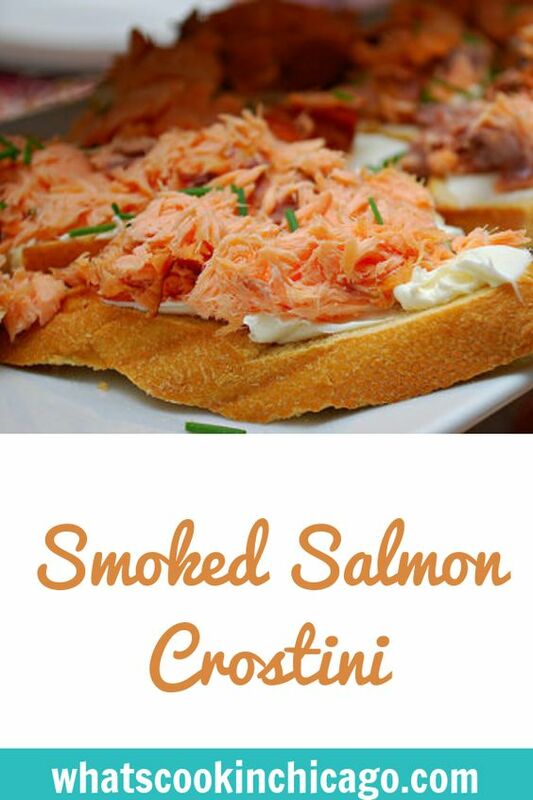 These Smoked Salmon Crostini are fantastic all on it's own and with enough on your plate, it can easily be considered a meal! If you're hosting a summer get together or thinking about taking an appetizer for a potluck, this dish is a wonderful choice. It's easy, quick and delicious too. It's not so much a recipe I can credit to anyone - it just happens to be what I like, so feel free to play around with it! You can do a spin of lox & bagels by topping with finely diced red onion, some capers, thinly sliced tomato... or even substitue the cream chese with mashed avocado! Want to go a bit on the wild side? Try a flavored cream cheese like garden vegetable, chive & onion, or chipotle. For this recipe, I used hot smoked salmon for flavor but you can certainly use the other times of salmon if you prefer! 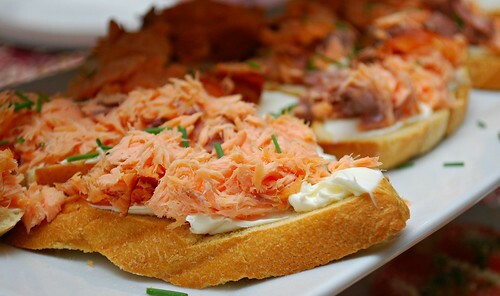 Spread the cream cheese on the toasted bread; top with salmon and garnish with chives.